When Meghan and Harry’s engagement was announced on Nov. 27, 2017, Kensington Palace only confirmed that their wedding would take place in “Spring 2018.” The next day, the palace offered a little bit more: get ready to welcome a new Duke and Duchess in May 2018. Other notable May weddings in the British royal family: Princess Margaret and Antony Charles Robert Armstrong-Jones (May 6, 1960) and Peter Phillips (Princess Anne’s son) and Autumn Kelly (May 17, 2008). As noted in the official announcement, the Royal Family will take care of Meghan and Harry’s wedding bill. For comparison, Kate Middleton and Prince William’s 2011 wedding cost an estimated $34 million, with $32 million going to security alone (via CBS News). 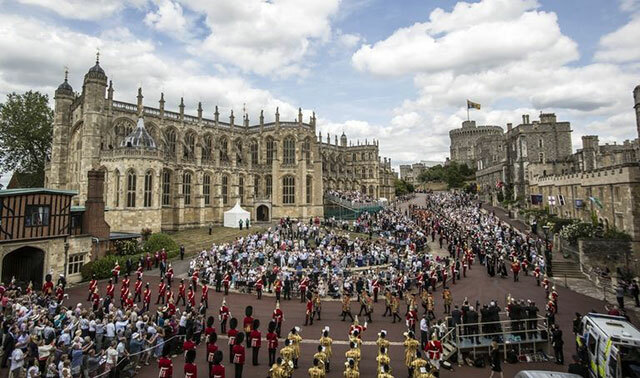 According to Kensington Palace, Meghan and Harry will say “I Do” at St. George’s Chapel in Windsor Castle, where Harry was christened when he was three months old in 1984. According to The Guardian, the chapel holds about 800 guests (compared to Westminster Abbey’s 2,000). As noted above, Harry’s cousin Peter Phillips tied the knot there with his Canadian bride, Autumn Kelly, in 2008. 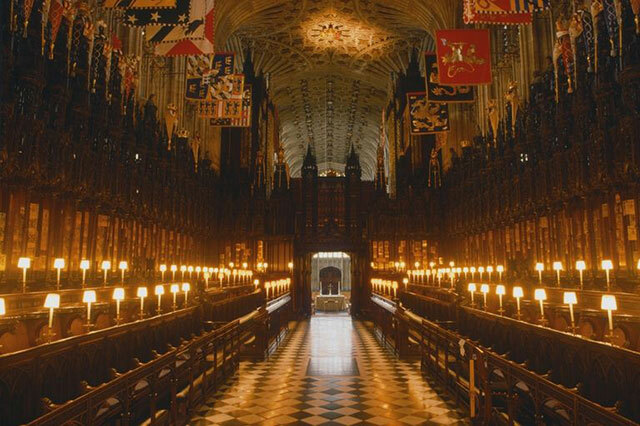 St. George’s Chapel is also where Harry’s father, Prince Charles, and the Duchess of Cornwall, held their televised religious blessings after their civil ceremony in 2005. Along with the wedding date announcement on Nov. 28, Kensington Palace revealed that Meghan will be baptized and confirmed into the Church of England before her May 2018 wedding. As PEOPLE reports, while Meghan attended a Catholic high school, she was not raised Catholic, with her father being an Episcopalian and mother a Protestant. Kate Middleton underwent something similar in the weeks prior to her wedding to Prince William in 2011. While nothing has been officially announced, a dream guest list would include the Obamas (who have worked on various charitable initiatives with Harry), the Trudeaus (Meghan is close friends with First Lady Sophie Gregoire Trudeau), Serena Williams (also another BFF of Meghan’s), the cast of Suits, the Beckhams (who also attended Will and Kate’s wedding in 2011), Priyanka Chopra (Meghan once interviewed her for her lifestyle website The Tig), Misha Nonoo (rumored to be the mutual friend who originally set up Meghan and Harry), and Rihanna (Harry and the Bad Gal met up to bring awareness on World Aids Day in 2016 and volunteered to take HIV tests together). 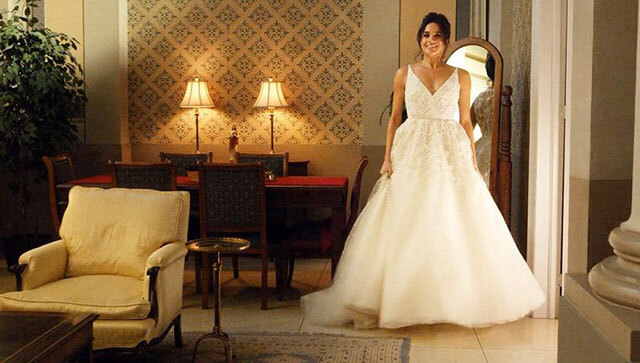 Ahead of a Suits episode in 2016, when her character Rachel Zane wore a wedding dress, Meghan spoke to Glamour to talk all things well, wedding dresses. At the time, Meghan revealed that she’s “a lot more relaxed” than her character but that she loved the low ballerina inspired neckline on Rachel’s dress. 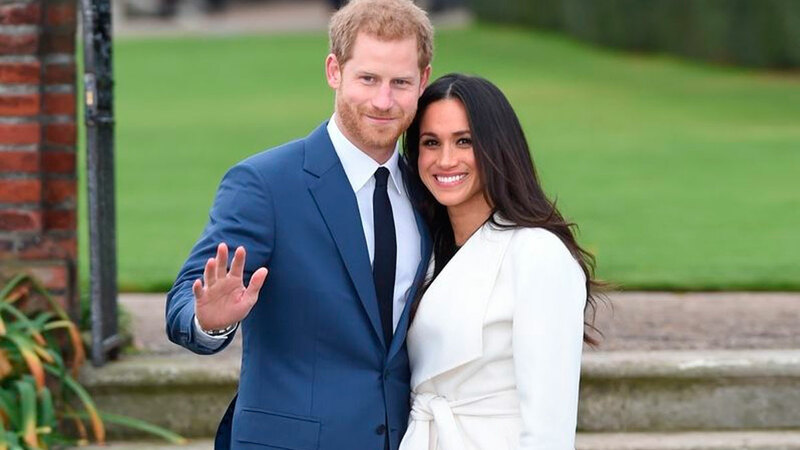 One designer Meghan might turn to for wedding dress inspo is her stylist and close friend Jessica Mulroney, who is also known for styling Sophie Gregoire-Trudeau. FYI, Mulroney knows a thing or two about “all things bridal and style.” Below, Meghan and Jessica on a 2016 trip to Italy. As previously revealed, Harry designed the three-stone diamond ring with British jewelers Cleave and Company. The center stone is from Botswana, a place close to the couple’s hearts, and the two side stones are from Princess Diana’s personal collection. 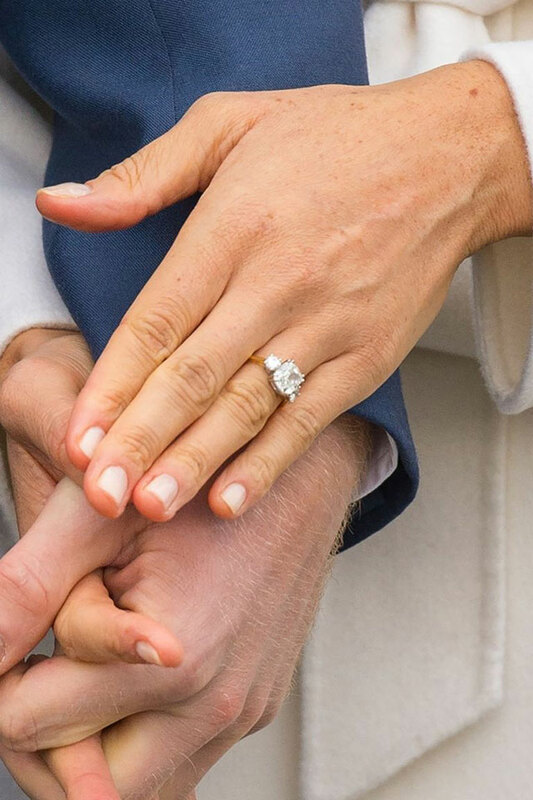 The yellow gold is Meghan’s “favorite,” according to Harry. Meghan and Harry’s first official engagements together will take place on Friday, Dec. 1, in Nottingham, with the couple meeting organizations that support people living with HIV/AIDs and the staff and mentors at Nottingham Academy about a program that prevents youth violence.